Allusion was a powerful tool in the hands of Late Antique authors. Tesserae now offers a wider selection of popular Late Antique texts. Authors such as Augustine, Ambrose, Cyprian, Tertullian, Orosius, Libanius, and many others are available for Latin/Greek or multi-text searches. For a full list of available texts, click here for Latin and here for Greek. These new Late Antique texts are drawn from the Open Greek and Latin Project, DigilibLT, and the Latin Library. Our editorial decisions reflect those of the hosting site (see http://tesserae.caset.buffalo.edu/sources.php). Spurious works are listed as [Author] Pseudo. We are still in the process of incorporating more texts, but if you would like to advance the progress of a particular author or work, please email Caitlin Diddams (acstaab@buffalo.edu). We hope you enjoy searching these texts! Measuring the co-occurrence patterns of words with pointwise mutual information (PMI) can help identify bigram word-pairs that are unusually represented in the work of a given author. By comparing the PMI values of the Latin epic corpus to the PMI values of Vergil, for example, scholars can discover which word pairings are particularly Vergilian. Many of these Vergilian phrases will be obvious, such as pius Aeneas and puer Ascanius. Others, however, invite further investigation. Some word pairings are so unexpected that they may be sufficiently marked for quotation and imitation. Tesserae is in the process of incorporating PMI data as an option for scoring search results. Tesserae scores currently rate rare words shared between two texts as more likely to constitute an allusion. This is problematic for capturing allusions from Vergil, who is known for combining common words in uncommon ways, in what ancient critics called a new form or affectation (cacozelia). The incorporation of comparative bigram frequencies can more accurately score allusions to Vergilian bigrams, which would otherwise be erroneously demoted. For example, if a search result is particularly indicative of the source author, but not of the corpus or target author, this might indicate that the target author is quoting a recognizable phrase. In this case, the Tesserae score should be increased. If the match is indicative of a target author’s shared language, but not of the corpus or the source author, it is less likely that the target author is trying to evoke the source author. In this case, the Tesserae score should be decreased. Many studies from the 1990’s on have shown the efficacy of analyzing word co-occurrence patterns in English. In 2000, Rydberg-Cox adapted existing methods for ancient Greek as a basis for philological research. PMI values represent a ratio of “actual” versus “expected” frequency with which two words appear near each. The actual frequency of a bigram is a measurement of the frequency with which a combination of words x and y occurs. The expected bigram frequency is a measurement of the frequency with which words x and y might have occurred as a bigram based on the frequencies of its constituent unigrams. This represents the bigram frequencies we would see if the distribution of each word were independent of the distribution of the other. In reality, contextual and syntactic relationships change the likelihood that word y will follow word x, and so the actual and expected frequency values diverge. Finally, because PMI overemphasizes low-frequency collocations, it is standard practice to cut off extremely rare words and to log and normalize the results. Results from the Aeneid and the corpus are then normalized so that PMI values can be meaningfully compared. Normalization translates the scale of the PMI values from Vergil and from Latin epic authors to a range from -1 to 1. Positive PMI values indicate that once you read one word in Vergil, the uncertainty of the next words dramatically shrinks. Negative PMI values indicate that the presence of one word in Latin epic negligibly affects the possibility pool for the next word. Consider the following example of a high PMI value from Vergil’s Aeneid 12.338: fumantis sudore quatit, miserabile caesis. Fumantis sudore describes horses frothing with sweat, and has a normalized PMI score of 0.684. Since PMI values for Vergil indicate that fumo usually occurs with incense, altars, food and homes, and sudor usually occurs with people, blood, and labor, fumantis sudore is “marked” or unusual phrase in Vergil. Since fumantis sudore is not a high ranking result in the PMI values of the Latin epic corpus, it is further likely to be an example of particularly “Vergilian” language. 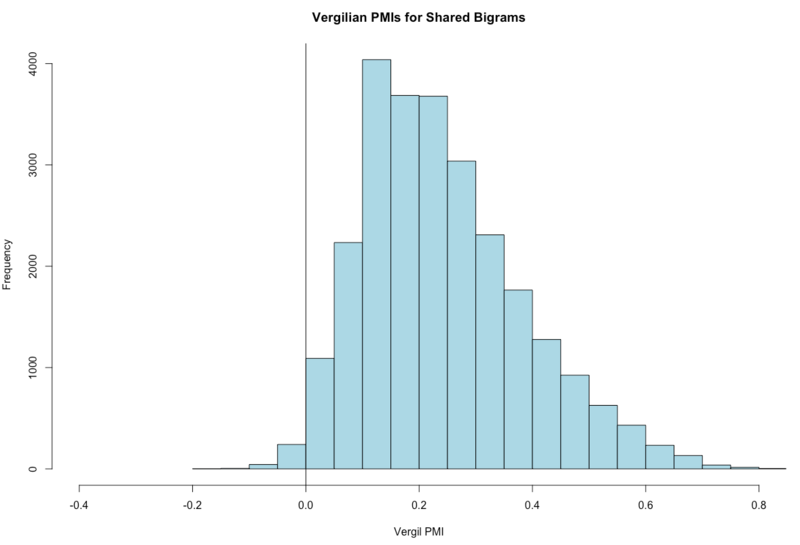 The following graph shows the PMI values for Vergilian bigrams that also exist in the epic corpus. Most of the PMIs are positive, indicating strong associations between words. The data with the highest PMI values represents the strongest word associations in Vergil. 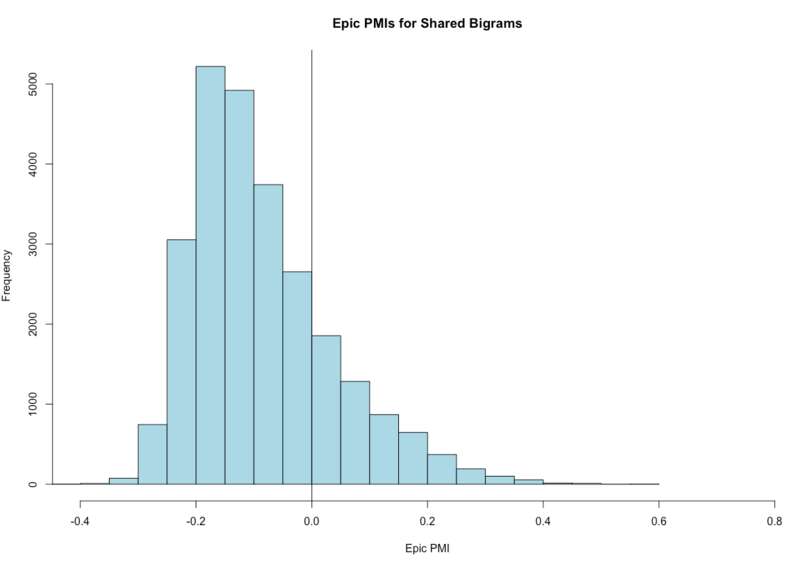 The next graph shows the PMI values for bigrams in the epic corpus that also exist in Vergil. Here, the PMIs are mostly negative. This indicates that in epic as a whole, word association is more flexible than in Vergil alone. These graphs indicate that Vergil’s word associations as different from those in the epic corpus generally. For example, Vergil’s normalized PMI for aequore~toto is about 0.5, occurring 6 times. In the rest of Latin epic, aequore~toto appears 9 times and has a normalized PMI of 0.03. The difference is that in Vergil, aequore expects toto, whereas is in epic generally, aequore does not prime the reader to expect toto. The data does not tell us which author differs from the corpus more dramatically – other normalization factors will have to be put into place before we can compare, for example, Vergil’s distance from the corpus to Lucan’s distance from the corpus. Beyond its applications for Tesserae, co-occurrence patterns can improve our understanding of what phrases are more striking or marked than others, and of what constitutes the recognizability of an ancient author’s hand. You can now use the multitext tool on our entire selection of Greek texts! The multitext search cross-checks your results against all other texts in the corpus. This will allow you to see whether a particular parallel is unique to your two selected works, or whether there is a broader precedent for the repeated expression. 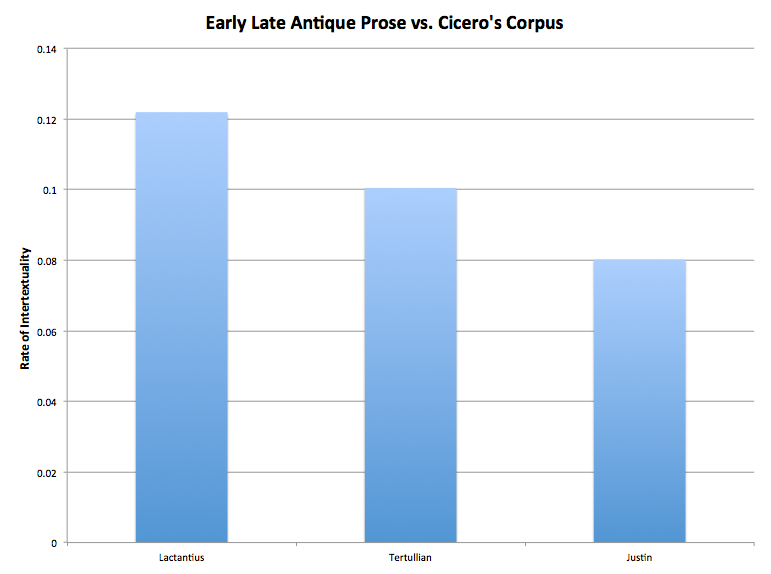 We are working to expand the Tesserae’s Latin corpus into late antiquity. Currently, the major works of a set of more commonly read authors are available for searching on the site. See here for a list of authors or here for a list of works organized by author. We are also adding this set of major authors in the near future. Finally, we hope to add this set of even later, lesser known, or less often cited authors after some improvements of the user interface, which may include separating the numerous searchable texts by era. If you would like to see authors added who are not on this list, or see a particular author prioritized, please email Caitlin Diddams at acstaab@buffalo.edu. All the major works of Lactantius, known as “the Christian Cicero,” are now available for Tesserae searches: Carmen de Passione Domini, De Ave Phoenice, De Ira Dei, De Mortibus Persecutorum, De Opificio Dei, Divinarum Institutionum, and the Epitome Divinarum Institutionum. When Augustine quotes portions of Paul’s epistles in De Doctrina Christiana 4, he records versions that are not attested by the Vulgate tradition or the Old Latin (Versio Antiqua) tradition. Since Augustine quotes closely from the Vulgate, (and sometimes from the Versio Antiqua), for Gospel and Old Testament passages in DDC 4, why not for Paul’s epistles? My data suggests that these Pauline passages, which appear as examples of style rather than content, are in fact rendered in a more Ciceronian style than alternative translations. Below are links to visual comparisons powered by Juxta Commons of Paul’s language as it appears in De Doctrina Christiana, and Sabatier’s Vulgate and Versio Antiqua, and exemplary passages from Psalms and Matthew. There are four options to visualize the differences: a heat map with hyperlinked variants, a side-by-side comparison, a histogram, and a VM model where all three versions can be viewed side-by-side (click “new version” after clicking on the VM button). While it is immediately clear that the Pauline passages show more variations than non-Pauline passages, it is difficult to get a sense of the degree of difference because the passages differ so severely in length. Juxta Commons, however, provides an quantitative measurement of distance from a base text to other versions. 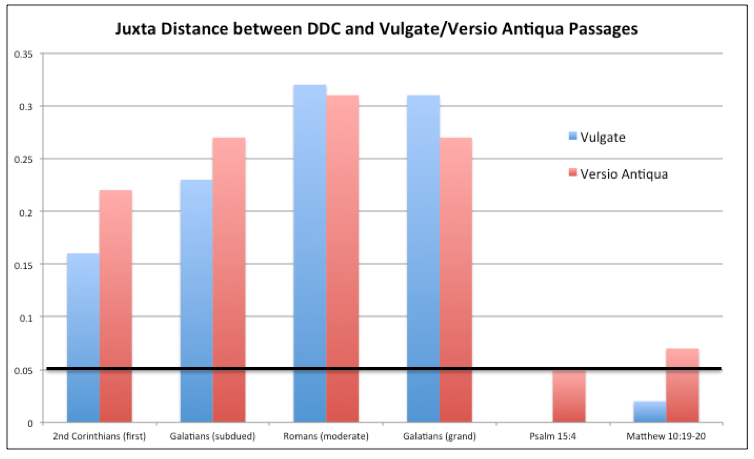 The graph below shows Juxta’s measurement of distance between the above passages as they appear in DDC and in the Vulgate / Versio Antiqua. The baseline drawn at 0.05 is the distance Juxta measures between Sabatier’s Vulgate and the Vulgate available on Perseus. It provides a sense of what degree of difference we might expect between manuscripts. This degree of difference demands explanation. The Pauline passages appear as block quotations, discouraging the interpretation that Augustine is weaving in his own language, as is often the case in his other works, in an extemporaneous style. These passages are not tied together thematically, but appear as distinct units with little or no connective language. It is also notable that Pauline diction appears in De Doctrina Christiana as models of style. Augustine argues at length that even though Paul was untaught in the classical rules of rhetoric, his eloquence displays the qualities of classical rhetoric such as climax, scala, and well-balance membra and caesa (DDC 4.11). He follows his quotation of many Pauline passages with extended colometric analyses, drawing on Cicero’s rhetorical metaphor of the body established in Orator, and continuing in DDC 4 to outline the officia oratoris and the genera dicendi according to Cicero’s model. These results are not particularly meaningful by themselves, but the composite of all the possible results like this is key component of style. 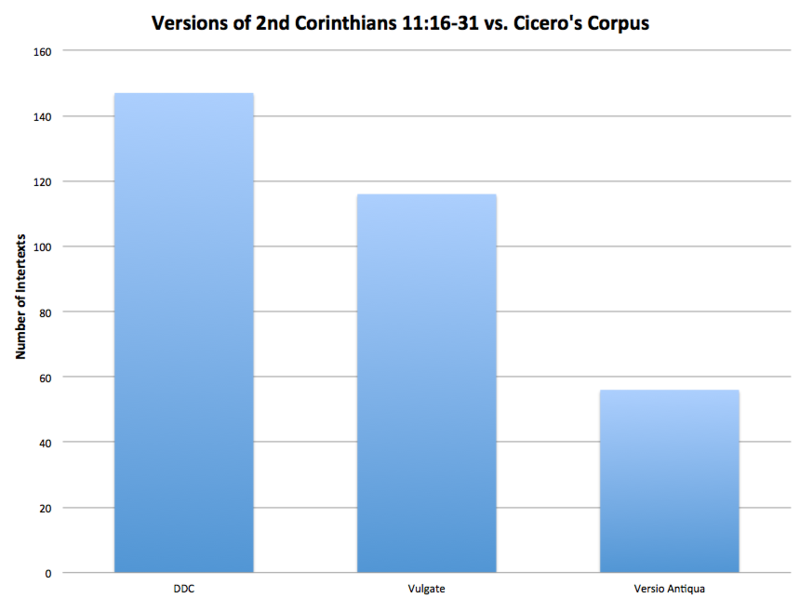 This graph displays the total number of times Tesserae found a set of match-words in Cicero’s corpus shared by each version of 2nd Corinthians. Thus the first column shows the total number of times Tesserae found one to four word chunks in the same position relative to each other in DDC and Cicero’s corpus. No similar pattern emerges from the same three passages tested against the corpora of Caesar, Tacitus, or even against another rhetorical work, Quintilian’s Institutio Oratoria. (Compare here: CaesC DDC CaesC VA CaesC Vul; Q DDC Q VA Q Vul; TC DDC TC VA TC Vul.) This suggests that Augustine’s translation does not intertext more frequently with classical works generally, and suggests that Augustine’s presentation of Paul’s language is indeed more “Ciceronian” than other Latin translations. This stylistic measurement remains consistent even when very small chunks of texts are compared to Cicero’s corpus. Following are Tesserae comparisions of small selections chosen at random from Lactantius, Tertullian, and Justin, each about the same size as 2nd Corinthians 11:16-31. This method supports the observations of ancients and scholars to this day who call the style of Lactantius Ciceronian. Such stylistic analysis can be used on other texts, like Augustine’s translations of Pauline diction, with greater confidence. 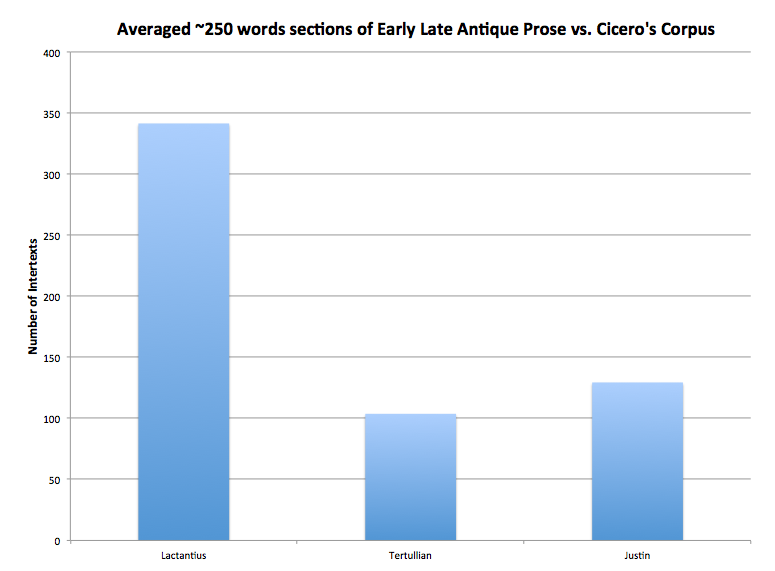 Future goals for this project include testing hundreds small sections of Lactantius, Tertullian, and Justin (and other authors) against Cicero’s corpus to get a more stable average. This will allow me to add meaningful error bars to the above graph and be more confident in the significance of an author matching Cicero “twice as much” as another. –unit phrase This makes a Tesserae search divide units of speech by phrase, rather than by line. This option should be chosen for all prose text comparisons. –dist 4 This constricts a Tesserae match to words that have two or fewer intervening words. The normal parameter is 10, allowing words to match across lines of poetry or across long clauses in prose. It’s important for a stylistic search to look only for words that appear very close to each other, rather than words that might constitute a element of intertextuality across a long distance. For comparisons with much smaller corpora, such as the texts of 2nd Corinthians compared to Caesar’s corpus, I widened the dist metric to 6. This includes a few more matches and provides a more stable measurement for otherwise very sparse results. –stop 0 This allows Tesserae to search for matches that include every word in the corpus. Usually this parameter is set to 10, which excludes the top 10 most common words in search texts from results. This is helpful for eliminating results in an allusion search, where the user probably won’t want to examine results including qui, sum, et, in, etc. For a stylistic search, however, it’s extremely important to include all words, developing a composite of all the combinations of words that make up an author’s style rather than unusual or salient instances that might be allusions. –feature word This instructs Tesserae to search for exact word matches rather than matches based on shared stems, or lemmata. Whereas an allusion might contain shared lemmata in different forms depending of local grammatical restraints, exact word matching allows Tesserae to capture elements of style like a tendency towards accusative + infinitive, a preference for a particular tense of a verb, etc. This kind of matching is much more precise for stylistic analysis. While many other stylistic measurement exist, Tesserae is unique in measuring shared language in the context of an author’s phrase (delimited by periods and colons). Tesserae also looks not only at word frequency, but at the relative position of sets of words to each other in phrases. This helps Tesserae capture style in ways that corpus word frequency measurements do not. I welcome comments and suggestions at acstaab@buffalo.edu. Jerome’s Vulgate is now available for Tesserae searches, either as full text or by individual book. Hunter – Apollonius:Richard Hunter’s commentary. Partially complete. Hand ranked. Apollonius’ Argonautica 3 vs. Homer’s Iliad and Odyssey. Knauer – Iliad: Knauer’s commentary. Complete. Hand ranked. Knauer – Odyssey: Knauer’s commentary. Complete. Unranked. Georgiques: Partially complete. Partially ranked. slj.txt Complete Tesserae results. Scored. Raw. bench3 Complete Tesserae results. Scored. bench4 Complete Tesserae results. Scored. Tesserae-2010-Benchmark Complete Tesserae results. Scored. Formatted and organized with matchwords in red. Tesserae-2012-Benchmark Complete Tesserae results. Scored. Includes statistical calculations. all_lucan Lucan’s Bellum Civile 2-10 vs. Vergil’s Aeneid. Raw. Achilleid: includes Vergil’s Aeneid, Ovid’s Metamorphosis, Heoides, and Amores, and Statius’s Thebiad. Complete. Unranked. Please feel welcome to contact us with comments or questions.